One of the things that sparked yesterday’s long walk was a book I read over the weekend, The Happiness Project by Gretchen Rubin. This book comes from the era of the “I did this thing for a year and here are my experiences with it” books, though it seems like she was unaware of the trend when she was doing it, and her blog grew out of the project rather than it being one of those blogs picked up to be a book. She read a bunch of books and research about different theories about what made people happy and spent a year trying all these things to see if it really made a difference in her life. I wouldn’t say that I’ve been unhappy, but I have had some dissatisfaction lately and thought it might be a good idea to reevaluate things. I’ve realized that there are a lot of things I enjoy doing but that I don’t give myself time to do. And thus the walk yesterday. There’s a wonderful park on the edge of my neighborhood where I can walk in the woods alongside a river bank, and I seldom seem to make it over there, even though I often think about doing it. I don’t think I got any earthshattering ideas out of this book. Much of what she was doing involved her relationships with her husband and children, and I don’t have those. With me, it’s more about decluttering and organizing my life the way I’m trying to do to my house so I can make time for doing things I enjoy. And then when I make that time, I need to actually do those things. That means more long walks on nice days, more time with music, time to make things. But another big part of it is creating the conditions in which it’s easier to be happy and at peace, which means taking care of my health and getting my environment in order. So I have all kinds of plans worked out, but don’t worry, I’m not planning to write a book about this because so many people have already done so. I’m sure everyone’s heard of the college admissions scandal that’s made the news this week. I went to one of the universities involved (the University of Texas). I did get in fair and square, and although it’s a lot harder to get into now than it was then, I probably still would have been automatically admitted since I was a valedictorian and National Merit Scholar. I didn’t even know until I got to school that there were courses you could take to learn to take the SAT. I just took the practice exams in the registration book, and I think I got a book from the library with more practice tests. Then I got to the university and learned that there were things like advanced placement courses you could get college credit for, as well as test prep classes. I was from a small town that didn’t have any of these options. I couldn’t help but wonder what my score would have been if I’d had that kind of help. Then there were the things people with money could take advantage of once they were at school. There were entire businesses providing notes and materials for classes — professional note takers who went to the big lecture classes (we had some classes with as many as 800 people in them) and took notes that students could buy so they didn’t have to attend the classes. The fraternities and sororities supposedly kept files of the notes and past exams for these courses to help their members. But I think my first real awareness of just how unfair the world could be came when I was applying for internships in my field, broadcast journalism. There was one highly coveted internship with the Austin bureau of one of the Dallas TV stations. That intern not only got to do real work, but it was a rare paid internship — a whole $4 an hour. I went above and beyond to apply, not only going through the formal process of submitting an application, but since I had press credentials for the state legislature, thanks to another internship, I got into the capital newsroom and approached the correspondent to talk to him about my application. He called me in for an interview, then had me come back for a second interview. He liked my work samples and my resume tape. I had high grades, good previous internships, and had even won a scholarship granted by the company that owned his station. He made it sound like I had the job and he’d be getting in touch with me to finalize it. About a week later, I ran into one of my professors, who asked what I was doing for an internship that summer. I told him it sounded like I had that one. He then told me that, actually, someone else had been hired. The photographer at the bureau next door had brought his younger brother with him to work and sent him over to talk to the correspondent. The younger brother was a bit of a screwup who’d dropped out of the school he was in (he hadn’t made it in to my school) and was looking for something to do. Not only was his brother in the business, but his father had been in the business and was influential. So he got the job on the spot. Then when I’d graduated and was looking for a job, I heard about an open position at the Dallas bureau of one of the networks. My real career goal was to be a field producer for a network — not being the on-camera person, but doing the groundwork to prepare the story — so getting in at the ground floor at a network seemed like a good idea. It turned out that this was more of an administrative/clerical job, part time, and at minimum wage. The bureau chief liked my resume and my tape and said I had the ability to do what I wanted — but I would probably never make it. He was willing to hire me, but he discouraged me from taking the job because it wouldn’t get me where I wanted to go. I’d have a better chance getting a reporting job at a local station and hoping for a big news event that would bring me to network attention. Otherwise, all the jobs were pretty much filled by network executives hiring their friends’ kids, and their friends hired their kids in return. If I didn’t have some connection with a major corporate executive or politician, I would have a very hard time making it in the business. After that, I started looking for other jobs in addition to reporting jobs, and after I got tired of going to interviews with news directors who were enthusiastic about me but admitted that they couldn’t hire me, I took a job in public relations. It was probably for the best because what I really, truly wanted to do with my life was write books, and I’m not sure I’d have had time to write novels while traveling the globe, doing the groundwork and investigation for TV news stories. But I do have to wonder how many talented, bright people there are who missed out on opportunities because they didn’t have connections. And then there are all the people without the smarts or talent who got opportunities handed to them and probably wasted them. I don’t think that guy who got the internship I was on the verge of getting ever ended up going into the business, in spite of his connections. As far as I know, he didn’t even finish school. For him, it was just something to do with his summer to keep him out of trouble and make his father happy. For someone else, it might have opened the door to a career. I guess this is something I’m also thinking about because the book I’m working on is about someone struggling to get past doors that have been shut to people like her. I do seem to be writing a lot lately about people upending unfair systems. Apologies for a few days of silence. I was having some issues with my web hosting service that made updates difficult. I don’t know if all is well, but it looks like it’s working for now. Meanwhile, I’ve been fighting the aftereffects of a cold. The serious symptoms lasted only a few days, but then bits of it keep lingering, so I’m not really sick, but I’m not entirely well, and I’m fairly exhausted. Fortunately, I’ve been at the phase of the book I’m working on where most of what I was doing was just reading for research. This week, I’ve been doing serious story development. I think maybe I’ll get to actually writing words tomorrow, and I hope by then I’ll have the brainpower for it. The last few days, I’ve been gradually improving, though with the slight problem that the better I feel, the more tired I am — probably my body needing rest after all that fighting it’s been doing. At least I’ve had the appropriate weather for being sick, as it’s been cold. As I start to get better, I almost feel a little sad about leaving “sick days” behind. I won’t miss the coughing, sneezing, and sore throat, but there’s something rather nice about the suspension of normal operations that comes with being sick. There’s no sense of responsibility, the things you “should” be doing. You can stay in bed all day, guilt-free. When you have a low appetite, you can pretty much eat what you want because you know your body needs energy. It’s a pity you have to feel bad while you’re enjoying these things. So I think a “sick day” staycation should be a thing, maybe call it a mental health day. Designate a day when you’re not feeling bad but you’re going to act like you are. Stay in your pajamas all day. Lie in bed reading. Watch movies or TV in the daytime. Eat soup and drink tea. For me, this would have to happen on a rainy day because it feels wrong to be sick on a nice, sunny day. I may have to wait until the fall to really do this, though, because I’ve got work to do to keep me going through the spring, and I’ve had enough real sick days. But the first cool, rainy day of fall, if I don’t have a deadline or some other obligation, I’m totally declaring a mental health day and taking to bed with a stack of books and a pot of tea. I mentioned the other day that I’ve been forced to admit that I feel better and am more productive when I exercise first thing in the morning. This time of year, the weather isn’t always conducive to that, so I’ve dragged out my exercise trampoline and walk or jog in place in the comfort of my living room. I’ve found that the best way to do this isn’t to watch exercise videos (though there are some designed for the mini trampoline that I’ll have to try). Instead, it’s travel videos, and my favorite thing is a series I found on Amazon Prime called Walks Around Britain. Basically, it’s about all the walks you can take on public footpaths throughout Britain. A camera follows the host for a walk as the various highlights are pointed out, so you kind of feel like you’re doing the walk, too. Each episode is about 24 minutes and contains two walks (they only hit the high points, so it’s not in real time, unlike the Slow TV Norwegian train rides, which can be fun, too). A full episode is just enough for a morning walk/jog, or if I know I’m going to be walking somewhere later in the day, one of the walks in an episode is enough to get the day started. This show makes me miss living in Europe. They have a similar network of public walking paths in Germany, and when we lived there, we’d often load up backpacks with drinks and a picnic lunch and head out on a weekend for a day’s walking. In one home, we lived right next to a forest with a lot of good trails, so we didn’t even have to get in the car to go for a long walk in the woods. 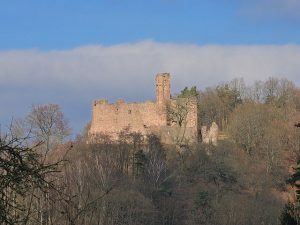 At another home, we lived near a hill with a ruined castle on top, so one of our standard walks was to go up the hill to the castle. We don’t have anything really like that here, not on that scale. There are some walking paths through parks, and there’s one I can walk to on the edge of the neighborhood. Unfortunately, most of those paths are near a river or lake and tend to flood. And our country is so much bigger that there are fewer opportunities to make an easy day trip to go walking and see the country that way. I got really nostalgic during this morning’s “walk” when the host was walking up a hill to a ruined castle (in Wales) with his daughters and dog. It was so much like those Sunday afternoons when we’d decide to just walk up to the castle, or when we’d drive to a place where the footpath would lead to or past a castle. I was already into reading fantasy books, but I suspect that being able to just take a walk to a castle on an average day helped fuel that interest. A castle became something concrete, not just something out of books. When I visited England, I got a map of some walks and spent a day walking from village to village in the Cotswolds. This show is making me want to go again to do more walking like that, since I love walking as a way of touring. I entertain the occasional dream of selling my house, getting a longer-term tourist visa, renting a cottage somewhere, and spending months exploring thoroughly while writing a book. Alas, for the time being, I’ll have to make do with the nearby park (if it’s not flooded) when I get the itch to walk in the woods. In my ongoing quest to optimize my life, I’ve come to one annoying realization: Exercise is key. I’m essentially a sedentary person. Most of the things I enjoy doing involve sitting — reading, writing, watching TV, knitting. My most active hobby is cooking. I do like taking long walks and going on hikes, but it hasn’t generally been a daily habit. I had to change that in the last couple of years. I’d been taking a ballet class and injured my knee during that, then ended up in physical therapy. The therapy required daily exercise, and my knee feeling better meant I started walking more often. I was doing well until winter hit, and I slacked off. Then the whole blood pressure/thyroid thing hit, and I was out of commission until I started feeling better, and then I was motivated to exercise more regularly. Alas, the winter slack-off thing happened again. It was too cold to comfortably walk in the morning, so I said I’d do it later, but then I’d get busy and not get around to it. This time, though, I started to feel the effects. The double whammy of the thyroid issues and the medication I’m on for the blood pressure means I’m extra sensitive to cold, so I tend to sit at home wrapped up in blankets, but then that made me even more sensitive to cold, and I just generally didn’t feel great. When there was a warm day and I took a walk, I felt so much better, so I’ve tried to get back in the habit. If it’s too cold to walk in the morning, I get out the jogging trampoline and walk/jog while I watch something (travel programs are good for that because I feel like I’m walking through some interesting place). What I’m finding is that if I exercise in the morning, I’m less cold, so I’m able to be more active throughout the day instead of sitting huddled in a blanket the whole time. I have more energy, and I’m more productive, getting more work done. If I want to stay healthy and functional, I need to make a habit of this. And I really kind of hate that. I like easing into my day, lazing around in pajamas instead of getting dressed and going for a walk. But I can feel such a difference that it makes no sense not to do it. Maybe after a long enough time of feeling that difference, I’ll look forward to it instead of having to force myself. In the meantime, I have to remind myself of how icky I started feeling when I was slacking off. This is right up there with the advice to write first thing in the morning instead of easing into the day. The difference it makes is too huge to ignore, but in a way, I hate that it works because I don’t particularly like arranging my day that way. Not only did Sunday mark the end of my crazy time, it was also the last time other than special events (like Easter) that I’ll have to deal with two services on a Sunday morning. Starting at the beginning of the new year, we’re going to a new schedule that merges the two traditional services into one that’s later than the old “early” service and earlier than the old “late” service. That will mean getting there a bit earlier every week, but never having to get there super-early and getting home earlier, for a longer Sunday afternoon. I’m looking forward to the change. But there is a big downside. The early service was where I managed to get over what had been a crippling stage fright where music was concerned. The choir didn’t usually sing for that service, so they’ve done various things over the years to provide music. For a while, they’d assign a small group to sing the same piece the choir would be doing in the late service. Since I’m a soprano, I knew I’d be heard, but it wasn’t quite like singing a solo, and that helped me broaden my comfort levels. Even after they started having the scholarship singers sing solos for that service (these are generally music majors from a nearby university who get a stipend for singing with the choir), during the summer they’d call upon regular choir members to do music, so I started with duets and eventually sang solos. But now we don’t have that outlet anymore, and I’m not sure what they’re going to do with the music in the new service. The Sunday school stuff comes afterward, so they’re on a tighter schedule, and that likely means they won’t be adding music. All the solos for choir anthems have been automatically assigned to the scholarship singers under the new choir director, so this means that there won’t be any more opportunities to sing solos, and if I want to maintain that comfort level I fought so hard for, I’m going to need to find new places to sing. I’ve been looking into some other choral groups, like community chorales or one of the local Sweet Adeleines groups. There are a few potential issues there — there tends to be a soprano glut, so they’re not exactly going to be excited about a new soprano, and that means solo opportunities may be as rare as they are at church, since newcomers will probably have to wait in line and there will be lots of sopranos with music degrees also trying to get those solos. Plus, I’m not sure I can deal with adding a commitment one night a week on an ongoing basis. They do offer the chorale at the local junior college as a continuing education/non-credit course, and it meets in the afternoons, so that’s a possible option. I’ve also considered exploring my interest in folk/traditional/Celtic music. There are some organizations in the area that offer lessons and some jam sessions/music circles. If I get my lip back in shape for playing the flute and get back on working on the harp, I might be able to find a group to perform with. (And this could also kind of count as work-related, since a lot of my story ideas incorporate music.) Even without finding a group, they seem to have some music circle opportunities where you can perform for others, and that’s really just what I want. It doesn’t have to be on a big stage, just staying used to the idea of other people hearing me sing. Or there’s musical theater. I’ve always loved it, but I’ve really only done one show. I’d been considering looking into some acting classes as a way to figure out how to better convey emotions in my writing, so that makes this also work-related. There is a big time commitment, but it’s shorter term. Instead of a night every week all year (or during the school year) it might be most nights for a month or so. But before I worry about any of this, I probably need to do some work to get my voice in better shape. It’s something that takes daily practice, and between being sick off and on throughout the fall and being caught up in working on books, I haven’t been doing that. And I also have a book due in January. But then I’ll start exploring more. I’ve been on a kick of trying to optimize my life, reading books about working habits, motivation, organization, etc. The latest one was Flow, by Mihaly Csikszentmihalyi. It’s about optimal experiences, getting into the frame of mind in which you function almost on autopilot, but at a high level. This is what happens when you really get into a task, to the point you have heightened awareness of what you’re doing while tuning out distractions, time seems to fly, and what you’re doing seems both easy and challenging — there’s enough challenge to keep you engaged and stretching yourself, but you’re in the zone where it still feels easy. I mostly read the book because I want to find good ways to get into this state for writing, but there was some other stuff that really made me think. One of the things that came up in the research related to the subject was that while few people would think they’re happier at work than during their leisure time, studies show that on measurements of things related to happiness, people actually do tend to feel happier at work. They’re more likely to get into this flow state, to feel like they’ve got a purpose, to feel engaged and challenged in a way that makes them feel alive. What generally makes people unhappy at work isn’t so much the work itself, but the environment, the people, corporate bureaucracy, etc. On the other hand, the way most people spend their leisure time isn’t that engaging. You don’t get into that optimal flow state by watching TV. The exception about being happier at work than at leisure was the people who have active hobbies, so they’re doing something other than watching TV in their free time. The author did consider reading to be “active” and something that can lead to a flow state. Practicing or performing music works, as does listening to music when it’s engaged and active listening, not just using it as background noise. Writing, painting, and making things, gardening, and even housework can also count. The book was written before social media and the Internet really took off, so I don’t know where he’d stand on web surfing or online discussions. The author thinks that this may be one reason why people seem to be less happy even as life gets easier. Before TV, people had to be more engaged in their leisure time. There were fewer passive pursuits, and people did the passive things that were available less often. Even rich people probably didn’t go to the theater more than once a week, and now we watch dramatic productions every night on TV. This really got me started thinking. I’d resisted adding more work time to my day because one of the perks of working for myself at home is having more free time, but that free time doesn’t do me much good if I’m not using it well. When I started writing first thing in the morning and was spending more of my day working, I was actually happier and more satisfied, and I didn’t miss that “leisure” time. I feel more like I’ve had a good weekend when I spend a good part of Saturday doing housework and organizing than when I don’t try to schedule my time and just goof off. I’ve been trying to limit my TV time and instead use that time for reading or doing other things. It’s funny how TV has become such a default activity, or how if there’s something later in the evening, I’ll look for something to watch in the meantime rather than turning off the TV and doing something else. Not that I think it’s entirely bad. A little downtime for the brain is good, and I think you can be mentally engaged while watching. I tend to analyze story elements. But there are so many other things I want to do, and I’m trying to really think about how I use my time. Apparently, there’s another book by this author that specifically deals with creativity, so that may have to be my next read. We’ve been having my favorite kind of weather this week, cool and gray, not quite raining, just a bit misty. The autumn leaves do look glorious on a sunny day, but I love the way the golden trees almost work as a substitute sun on cloudy days, serving as a bright pop of color. I really enjoy my morning walks on these days, and then coming home and having a hot cup of tea. Though this morning, I dressed a little too warmly for the walk once I got going, and I came home hot and just wanted cold water. I need to remember to expect to be a bit cold at first, and then I’ll warm up quickly. I may be on the verge of becoming a bird watcher. There’s a network of waterways through my neighborhood, and we have a community of ducks that lives here year-round, but at this time of year, we also get the migrating birds. There’s one kind that I’m trying to figure out. They’re sort of duck-like, but very different from the mallards who live here. They look a bit like loons, but I haven’t heard any of the loon sounds. I’ve been hearing geese, but haven’t seen any of them. Then there are the egrets and herons. Watching all of these birds is fascinating. The other day, they seemed to either think that some leaves in the water were fish or they were playing a game because they were taking turns swooping out onto the water, picking up a leaf, and taking it to shore, where they’d throw it at another bird. I also like trying to identify trees by their leaves. When I was in fifth grade, we had to do a science project in which we collected as many varieties of leaves as we could find, pressed them in wax paper, and tried to identify them. On the plus side, we lived on the edge of a great forest with walking paths through it, so it was incredibly easy to get leaves. The challenge was that we were in Germany, and the reference books in the school library were American, so the species didn’t quite line up (and this was long before the Internet). I can still identify a lot of trees, but the purely American ones are harder for me. The squirrels are also fun at this time of year as they run around with their mouths full of acorns. Normally, they don’t seem to mind people, but now they hide from everyone, probably thinking we’re going to steal their stash. Help! I’m starting to sound like a food blog. This is where I’d finally start talking about the recipe and how I like to eat it when I come home from one of these walks. We’d have a few more paragraphs about the recipe and what I like about it, then lots of pictures of it, then finally the recipe. I should have taken pictures of all these things I was talking about, but I’m usually so busy looking at it all that I don’t think to stop and take pictures, and since I’m walking for fitness, I don’t think about stopping at all. I just take pictures with my eyes and mind so I can remember it. I’ve been getting things organized lately and have been on an optimization kick, trying to find the way to do things that works best for me. So far, I’ve got my kitchen mostly organized (there’s a bit of fine tuning to do, but I can live with the way it is now) and have established routines and procedures that have kept things in order and clean to the point that it’s only taking a few minutes a day to maintain it. I have my closet and dresser drawers mostly in order (though I could stand to do another big wardrobe purge and then do some fine tuning). I can find things easily, and I have a place to put everything, so I can do that “a place for everything, and everything in its place” thing. What I discovered yesterday when I was searching for supplies for a children’s choir project is that I’ve become so accustomed to these parts of daily life being easy that the parts of my life that aren’t organized at all are even more frustrating. There’s no order to my office, where I store things like that. I do have a designated choir supplies bin, so it’s partially organized, but there are other things that I needed that are scattered all over the place or buried under things I got out when I was looking for something else. At the moment, I can’t even bear to be in my office because it’s such a mess. Which means that needs to be my next project. I’d like to be able to go back to working in my office. Unfortunately, it’s become a sort of dumping ground for things from the rest of the house so that I can keep the living space in order. Getting the office together is going to be a rather massive project. I think I’m going to start by getting the desk straightened and cleaned, then move out from there. If I start working in there, I’ll be more driven to deal with the rest of that space, and that can become something I do during short work breaks — take a few minutes to go through that box and file things. I’ve always had a bit of an organized streak — I used to alphabetize my band music in my folder. That made things easy during football season when I could flip through my folder to immediately get to any piece the band director called up. During concert season my freshman year, the one year I had to share a folder (after that, I played oboe and was the only one), fortunately my folder mate was as obsessive as I am (if you watch that reality show about the Dallas Cowboys Cheerleaders, my folder mate was Kelli, the director). But I’m also easily distracted and a perfectionist, which results in a lot of slobbishness. Instead of just tidying, it has to become a project, and then I’ll get distracted midway through, with the result being a bigger mess. I think I’ve reached a stage in life when the mess gets to me, and I’ve learned that making it a little neater is better than demanding perfecting and doing nothing. When I have things in order, then I can maintain them easily with less effort. Also, I’m in the middle of a book, when suddenly I need to organize and clean all the things. Meanwhile, those new ideas are flying furiously. This is why finishing a book is such an achievement. It’s not so much about coming up with ideas and putting words together as it is having the discipline to power through when you keep getting new ideas and you desperately want to alphabetize the contents of your freezer. When I recognized my anniversary of starting to write the Enchanted, Inc. books, I realized that there’s another anniversary around this time of year. It’s not directly related to writing, though it did sort of pave the way toward where I am now. Around this time twenty years ago, I was working at a PR firm and got invited to lunch by a former client. It turned out that she’d gone to work for a different agency, and she’d been working on an account I used to have. We’d been working with a division of a large company, but the large company decided to consolidate all their public relations into one firm, and it was that other agency. Now that they had my former client, they wanted to hire me to work on the account. I was really unhappy in my job, and I’d enjoyed working on that account. The client had become a friend (we’re still friends, and she helped me find a lot of work when I went freelance). An interview later, and I had the job. I set a start date for the beginning of November, figuring that would give me time to work out my notice and have a bit of a break, and it would be after most of my new office would be coming back from a trade show (since there wasn’t much point in starting a new job while all my coworkers were out of town). But when I gave my notice, they made me leave the next day. That wasn’t too surprising because people tended to just disappear at that company. The surprise was that they let me have that next day so there could be a going-away lunch. More often, the person giving notice was made to clean out their desk that evening — under supervision, so they couldn’t take anything relating to their clients with them — then walked out the door. Their office door was kept shut until a meeting was held the next morning to announce that they were gone (usually with what we’d later learn were lies about why they left — everyone was always supposedly fired because they just weren’t working out, but when I ran into those people later I learned that they took another job). I’d anticipated something like this, so I’d cleared most of the stuff I wanted out of my office before I gave notice. But this meant I had a three-week break between jobs, during October, which is my favorite month. It was wonderful. I took a trip to Austin to meet up with some college friends. I took a few day trips around the area. And I took a lot of long walks around my neighborhood. I did some writing, finished unpacking (I’d moved into this house that summer), and read a lot. It was wonderful, and it was hard to go back to work when it was over. I remember thinking then that this was what my life would be like if I could ever just be a writer and not have to have a day job. Unfortunately, I don’t think I’ve lived up to that ideal. I don’t really take advantage of my freedom in a positive way. When you have all that time, it’s easy to waste it. Of course, there’s far more work than I was doing then. I was just playing around with some story ideas, not writing on a deadline. I wasn’t having to blog or maintain a social media presence or stay on top of sales numbers, or anything like that. But it would be nice to get back a sense of that freedom that I had then, making the most of the time I had and enjoying all the moments. Every year, I keep saying that I’m going to try to take the fall off to enjoy it, but I always end up with deadlines. Maybe next year. Or maybe I can do better at striking a balance, getting the work done and using my spare time on things I enjoy instead of refreshing Twitter or looking up random things that have popped into my head.